Apartment hotel White Fairy is a luxury development in the beautiful mountain resort of Bansko, built in the traditional for the town architectural style. The building is situated in UPI VIII-169, kv.263, next to the river Glazne, 10 minutes by walking to the historical centre of the Bansko and 25 minutes to the Gondola. There are a Bulgarian tavern “Banski han” and swimming pool near to the complex. There are 19 luxury studios and apartments. Most of the apartments have beautiful mountain views of either Pirin Mountain or Rila Mountain. 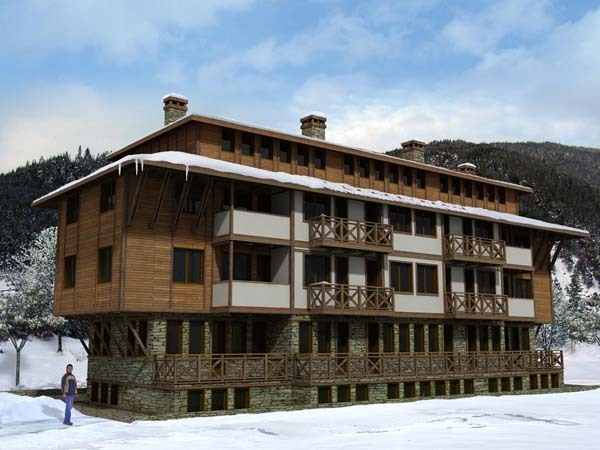 Ground floor – Apartments - 6; SPA center, ski wardrobe. -	walls – latex finish. -	sanitary unit – toilet, sink, mixing tap, boiler, mirror. -	ceiling – latex and plaster coating. -	Organizing and managing the payment of all running costs for use of the public areas and systems (electricity and water supply). This listing has been viewed 2099 times.